For nearly a hundred years, dams blocked salmon from their spawning grounds on the Elwha River and changed the face of the land. When those dams came down between 2011 and 2014, there was an amazing story of transformation to tell, but traditional photos, video and data charts simply couldn’t do it justice. That’s why Brian Footen MES ’01, and his company, Flying FishViews (F2V) wanted to demonstrate a dramatic new approach to storytelling and environmental study that could take people on a journey of exploration and discovery above and below the water. Brian Footen, F2V president and environmental science director, shows off the company’s newest camera. The Elwha River travels through the Olympic National Park (Wash.) and the ancestral homelands of the Lower Klallam Elwha Tribe. Two dams, Gline Canyon and Elwha, were constructed on the river in the early 1900s, without the fish ladders that would have enabled the region’s plentiful salmon populations to travel upstream and spawn. Spawning habitat was also damaged below the dams. As a result, salmon harvests plummeted, with negative consequences to the area’s fishing industry, livelihoods, and tribal culture. The National Park Service’s (NPS) dam-removal and ecosystem-restoration project on the Elwha remains the largest of its kind in history, according to the NPS. The removals posed exciting questions about the river, the ecosystem, and the salmon. To answer these questions, and share the story of the river more widely, Footen and his colleagues at F2V proposed an innovative partnership with the Lower Klallam Elwha Tribe; a river-mapping project that would capture images and data from above and below the water, taking viewers on a scientifically-informed virtual tour of the recovering river. It was a first for F2V. Footen, who founded F2V with three longtime friends, is the company’s president and environmental science director. After earning a Master of Environmental Studies from Evergreen and a Master of Science in fishery science from the University of Washington, he spent much of his professional career working as a fisheries scientist with state and federal agencies and Indian tribes. He brought that expertise to F2V. The FishView TM from which the company takes its name describes panoramic tours F2V creates from location-based data and pictures. Viewing an F2V virtual tour is very much like soaring just above—and under—the water surface and examining the waterway’s physical ecosystem features in high definition. Footen and his partners collect the images and data from aboard specially equipped rafts. A panoramic camera perched six feet above the raft floor snaps photos in synch with an underwater camera, sonar, and water-quality measuring equipment. The information can be posted and viewed immediately on F2V (beta), the cloud-based virtual platform the company has developed for the Web and mobile devices. Users can also share their own data, helping to create a more detailed picture of waterway habitat for everyone to use. This Chinook salmon was one of the first F2V photographed above the dams after they were removed. People sometimes assume that F2V uses drones, otherwise known as small unmanned aircraft systems or sUAS, to capture its images. But since sUAS have not yet been approved for commercial use in the U.S., F2V focused first on developing two-dimensional fish-view technology. Their three-dimensional product is now in the research and development phase. 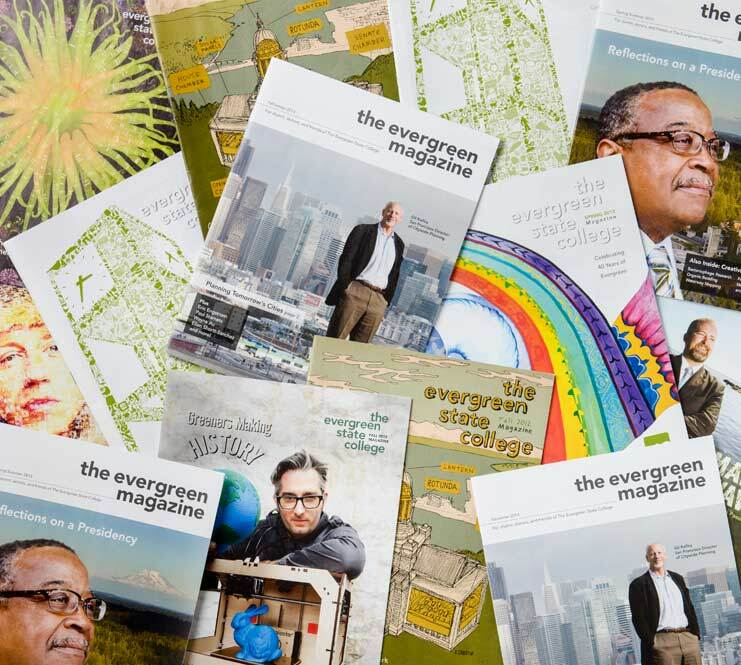 “Every river tells a story, but if it’s told only in data points, very few people will hear it,” he said, adding that he learned from Evergreen’s Enduring Legacies: Native Case Studies leaders, faculty emeriti Barbara Leigh-Smith and Jovanna Brown, that telling convincing stories is a powerful way to influence public policy and bring about needed change. Footen took an example from mapping the Elwha. “Rivers are so important to the tribal community, it seemed right to invite the Elwha Tribe to be our first partner. The Elwha Tribal Council was impressed when we showed the council what we wanted to do. They allowed our river team to access the river on reservation land and we were out on the river just 48 hours after the last chunk of dam came down,” Footen said. Soon the F2V river crew will return to the Elwha to map what the river looks like one year later, capture new habitat features as well as measure any changes in the river water’s chemistry. “Unimpeded for the past year, the Elwha River has formed new channels. We will be able to overlay last year’s FishViews TM with the next version and see the changes.” Footen added that turning the data into a compelling visual canvas will help tell the Lower Elwha Klallam Tribe’s story to environmental scientists, recreational river users, conservationists, natural resource agencies, and others, and contribute to data sharing about the river and discourse about dam removal. Within the next year, F2V expects to have a fully developed product, more project partnerships, and its first paying customers. In five years, they aim to be a big data company, “the internet of waterways,” said Footen. Read Footen and Brown’s case study, “Back to the Future: Dam Removal and Native Salmon Restoration on the Elwha River,” on the Enduring Legacies: Native Cases website. See the amazing F2V images of the Elwha River.